Probably the most asked question of me, and usually the first question, is "Where is the best place to stay In London?" This is, in my mind, probably the most important decision you'll make when planning your trip to London. After 27 trips to London, I can tell you that there have been places I stayed which made it very difficult to get around to see the sites, along with other issues like getting to and from Heathrow airport and a few others. After just a few trips I quickly learned, and completely by trial and error, that the Paddington section is hands down the best place to stay. 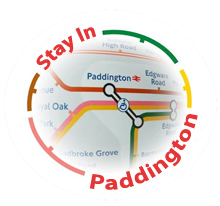 So much so, I created another website promoting Paddington as the best place to stay. Click on the logo above to visit the site and you'll quickly see why Paddington is simply the best choice when considering where to stay in London.